At times, there are recipes that I concoct which defy categorisation or even label and this is a very good example. The day I was making it, I was asked by three people what I was having for dinner and I was at a total loss for words. I mean, how do you explain a bowl of mixed mash, which briefly sums up this kooky mess?! To quote Francois Mauriac, “To love someone is to see a miracle invisible to others.” And that is exactly how I feel about today’s recipe. 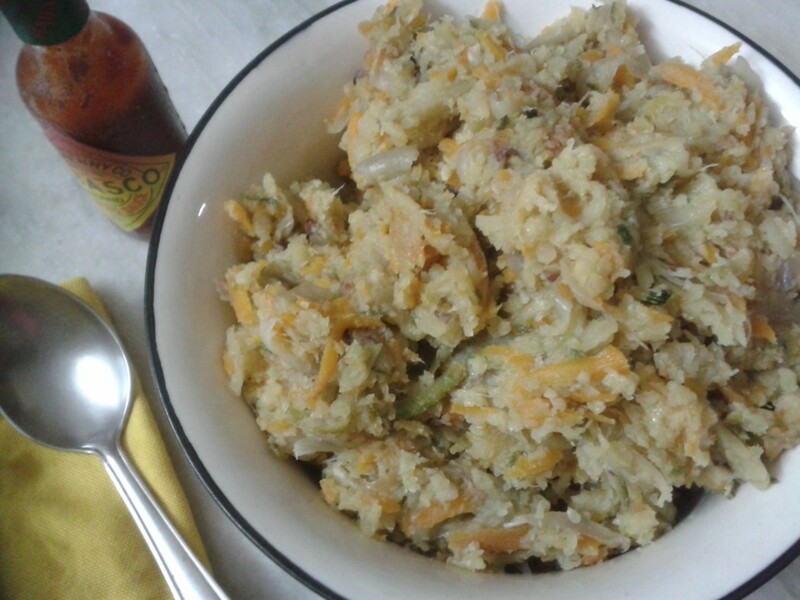 a bowl of mashed vegetables may not be to everyone’s taste but I am totally in love with this utterly comforting mess! Wash, boil, peel and mash the sweet potato. Wash, scrape and finely grate the carrot. Peel, wash and finely slice the onion. When hot, lower the heat and throw in the sliced onions along with salt to taste. Mix well, cover and cook for 5 minutes. Uncover and add the shredded cabbage and grated carrot. Once again, cover and cook for 7 to 8 minutes. Uncover and add the mashed sweet potato, freshly ground black pepper and cheese. Mix well and pat the mixture down. Serve hot or warm with some hot sauce. For the past several weeks, I was having serious hardware problems with my laptop which kept me off the internet. Won’t bore my kooky readers with the saga but the sum of the story: my hard drive had to be reformatted, OUCH! Had a few recipes and photos lined up for posting here, now they are all gone :-(. I got my laptop back just before I was off on a four day break to Goa and so it delayed my coming online that much more. Now that I am back with a well-behaved machine, looking forward to resuming my kooky postings :-). Today’s recipe is one which I threw together at the very last minute. Returned from Goa to a frugal kitchen home to some onions, ginger, chilli, carrot, tomato, coriander and cheese. I had brought back with me local brown bread known as poi (seen in the photograph) so decided to make an eclectic omelette. The premise of this recipe is to cook the “base”, cool it down and add it to the beaten eggs to make an omelette. 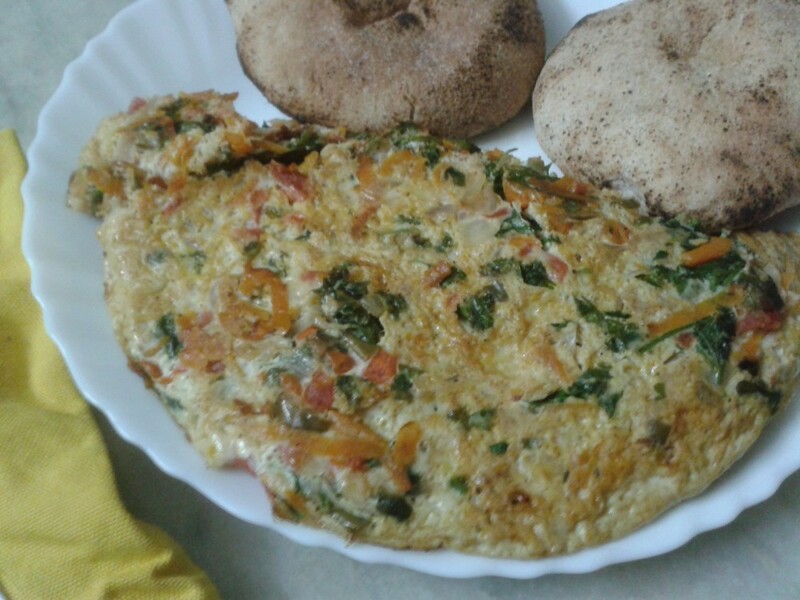 This results in a nice, firm omelette (as opposed to watery one which can sometimes happen when you add vegetables). If you would like to try this recipe (or rather, method) use whatever you have on hand in terms of vegetables and cheese. Bits of bacon or ham would also make a welcome addition. Poi is a type of Goan bread which you can get in white and brown variety (I had the latter). In terms of taste, it is a bit like the Italian Ciabatta. It is sold freshly made early morning. If you miss the morning delivery, you won’t get it again during the day (at least, this is the case in some parts of Goa). It is moreish and a very good match for any type of egg recipe. Without further ado, let’s get cracking with this eclectic omelette. Peel, wash and finely chop the onion. Wash and finely dice the tomato. Wash, scrub and finely grate the carrot. Wash and slice the chilli. Wash, peel and finely grate the ginger. Wash, dry and chop the coriander. Crumble or cube the cheese. Heat the oil in a wide base frying pan. Once it is hot, add the onion, tomato, carrot, chilli and ginger. Mix well, lower the heat, cover and cook for 10 minutes. Once the time is up, take the pan off the heat and let it cool down. You can do this in advance. Add the coriander along with a pinch of salt and pepper to taste. Mix well and tip in the contents of the frying pan to the eggs. Put the pan back on the burner and turn on the heat. Mix all the ingredients in the bowl so that the eggs and vegetables are totally into each other (!). Once the pan is hot, add the eggy mixture. Turn the heat down to minimum, cover and cook the omelette for 10-12 minutes. Carefully flip over and cook the other side for a few minutes before dishing out. The weekend gone by was one with multiple moments on the lips and so to ensure that the indulgences are not for a lifetime, I am on a “lightweight” food routine to redress the balance! 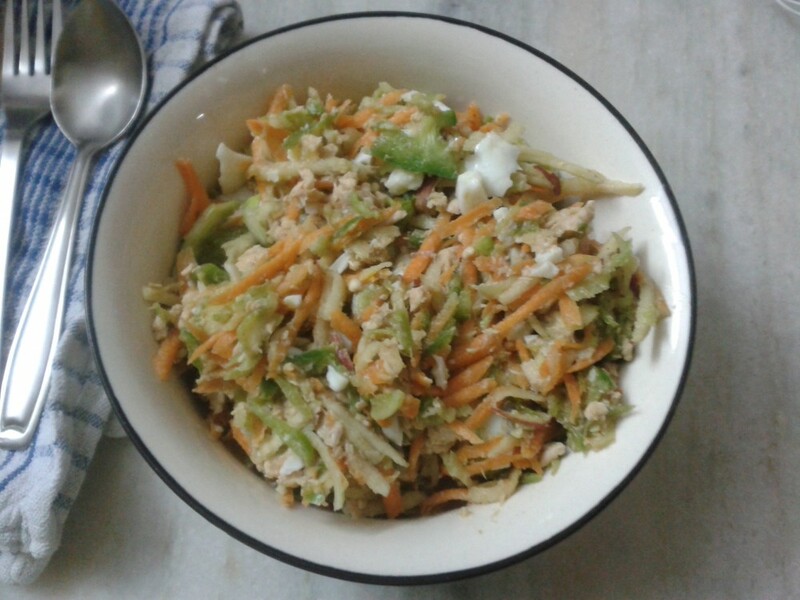 Was planning on a simple salad dinner when I got the idea of making an Oriental style slaw with some canned salmon, carrot, cucumber, apple, green pepper and egg. Didn’t have cabbage but I think this slaw works better without it. The dressing is my made-up recipe and it has me hooked so will be experimenting with it in other dishes in the future. Straightforward ingredients go towards a simple salad which is elegant, subdued and easy on the tummy. Drain the salmon, flake it with a fork or your hand and put it in a salad bowl. Hard boil the eggs. Once cool, coarsely grate them. Scrape, wash and coarsely grate the carrot. Wash, de-core, de-seed and coarsely grate the green pepper. Wash and coarsely grate the cucumber. Wash, de-core, de-seed and coarsely grate the apple. Add the grated egg and vegetables to the salad bowl. To make the dressing, whisk together the wasabi paste, soy sauce, vinegar and oil with a pinch of salt. Add to the salad, toss well and serve either at room temperature or refrigerate for a couple of hours if you prefer it slightly chilled. If you don’t have rice wine vinegar, use any other natural vinegar like white wine or cider. Although I eat a lot of pulses and whole grains, I have realised that I don’t cook dal the Indian way (rather, hardly ever). Ironic considering the fact that Indian cuisine has a rich repository of dal recipes from across the country; different states and communities have their unique way of cooking this staple. I favour one-pot meals and so I think I feel a bit lazy when it comes to cooking plain dal because than I would have to make a vegetable to go with it and that means more cooking and more washing up! So I am delighted to share with you a one-pot meal, uncomplicated and quick dal recipe which requires no pre-soak and few spices. 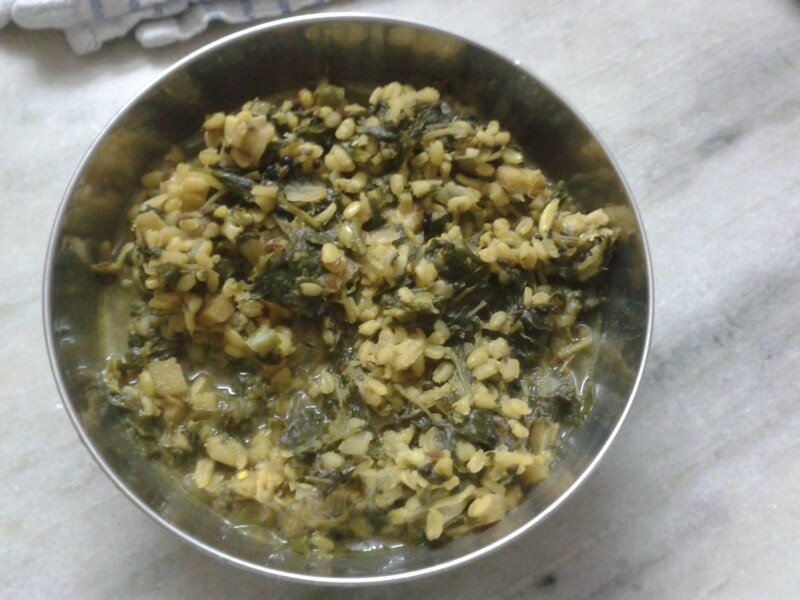 I have combined the easy cooking yellow moong dal with methi leaves for a balanced dish. You can substitute methi with any other leafy vegetable. Goes very well with, both, rice and any type of bread. Wash and drain the methi leaves. Set aside. Wash the dal and leave it in 1/4 cup of water while you prepare the other ingredients. Peel, wash and dice the onion. Wash and slice the green chilli. Peel or scrape, wash and chop the ginger. Heat the oil in a frying pan or pressure cooker. Once the oil is hot, lower the heat and throw in the mustard seeds followed by cumin seeds. As soon as the seeds start spluttering, add the asafoetida and stir for 30 seconds. Next, add the chopped onion, garlic, chilli and ginger. 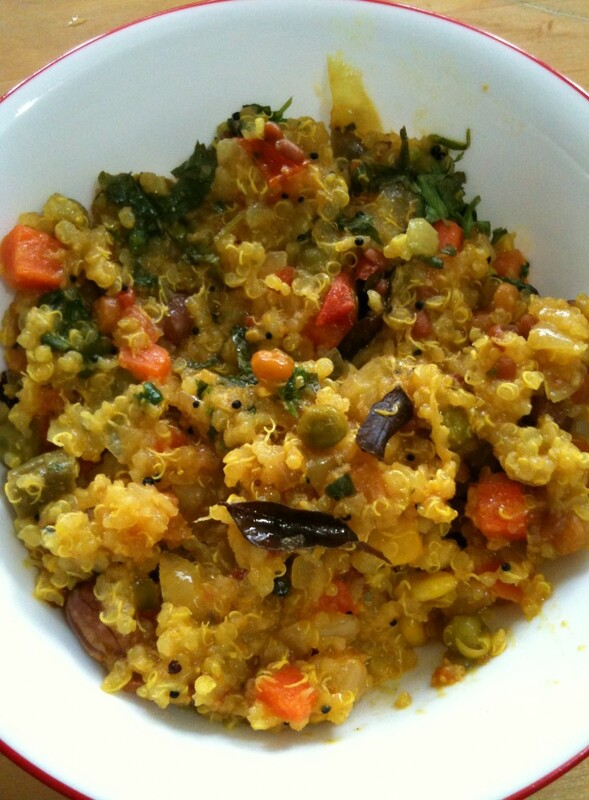 Uncover and add the fenugreek leaves, dal along with the soaking water and turmeric powder. Mix well, cover and cook for about 20 to 25 minutes till the dal is soft. If cooking in pressure cooker, cook on high pressure for 4 to 5 whistles. I find that having canned fish like tuna or salmon in my kitchen cupboard is very handy, specially on those days when I can’t think of what I want for my dinner. There are so many different ways one can play around with the fish. Have been meaning to experiment with tuna salad for quite some time so when I was stuck for dinner idea the other day, it provided me with the perfect opportunity to get kookily creative. This is another main course salad which balances contrasting flavours and textures. The sweetcorn has been grilled over the flame for a smokey taste (smokiness enhanced by some smoked paprika in the dressing) and I have also thrown in some extra vegetables for good measure. I wanted to include sweet potato in the salad but didn’t want it boiled and mushy so decided to make croutons instead. Follow this method to make sweet potato croutons. Char grill the sweet corn on a flame. Alternatively, you can do this in a grill or an oven. Once the sweet corn has cooled down, remove the kernels. The easiest way is to run a knife down the cob. Wash, scrape and coarsely grate the carrot. Wash, wipe and finely dice the tomato. Trim, wash, wipe and finely chop the spring onion (including the green part). Wash, dry and chop the dill leaves. 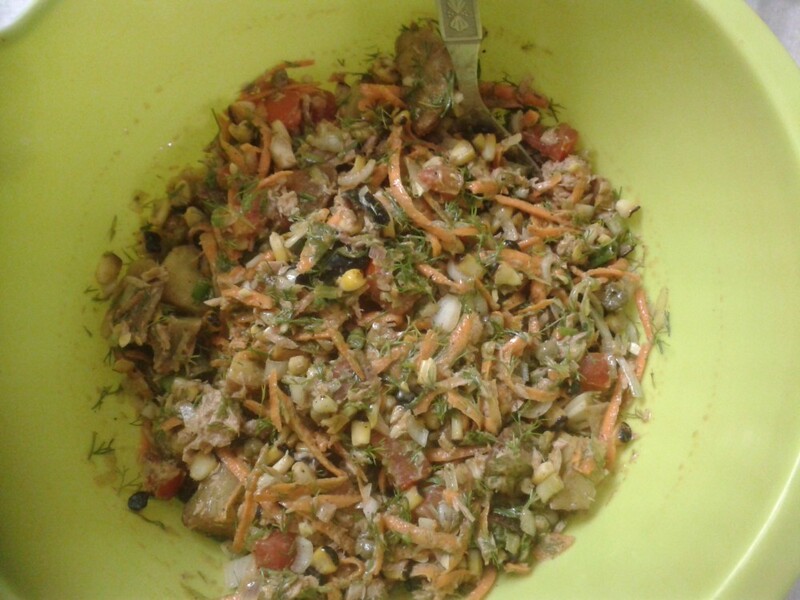 Take a large salad bowl and throw in the sweet corn kernels, tuna, carrot, tomato, spring onion and dill. Add the olives and capers and toss well. In a bowl, whisk together the olive oil, juice of lime or lemon, black pepper, smoked paprika, mustard powder, rock salt and mayonnaise. Pour this dressing over the prepared salad and mix everything together. Lastly, add the sweet potato crouton, mix once again and serve. Having just returned from a very indulgent break 🙂 and half a kilo weight gain :-(, I fancied something low fat, healthy yet satisfying for my dinner. Since I had ingredients for salad lying around, I decided to build on what was on hand and the result is this main meal salad recipe. something raw, something cooked, something steamed, something char-grilled, something sweet, something smokey, something spicy, something tangy, something salty all on one plate: sounds like a Britart exhibit doesn’t it?! The recipe calls for plenty of garlic and mint, garlic to aid digestion of otherwise gassy beans and mint to balance out the pungent garlic taste. So if you are a fan of these two ingredients, definitely worth giving this a go. Wash and scrape the carrot. Remove the top, cut into thick batons and put in a steamer. Once the steam starts coming out, set the timer for 6 minutes. Take off the heat once steamed. Put the batons on a plate to cool down. Wash and grill the peppers either directly on a gas burner or in an oven (in which case drizzle a bit of olive oil). Once the peppers have cooled down, remove the skin, core and seeds and cut them in strips. Set aside. Peel, wash and finely slice the onion in half moon shape. Separate the rings. Wash and wipe the cherry tomato. Slit them with a knife leaving the base intact so that the salad dressing penetrates. Wash and halve the Asian pear. Remove the core and slice it. Wash and halve the cucumber and slice it. Take a large salad bowl and throw in the cooked beans, steamed carrot batons, sliced char-grilled peppers, cherry tomato, onion, Asian pear, cucumber and mint. Now make the dressing. Peel and grate the garlic. Whisk together the olive oil, cider vinegar, juice of lime or lemon, garlic, honey, jalapeno flakes and salt to taste. Check the dressing for taste and add whatever you feel is lacking. Pour the dressing over the salad, toss well and serve. What I like about cooking with quinoa is how adaptable and flexible it is. 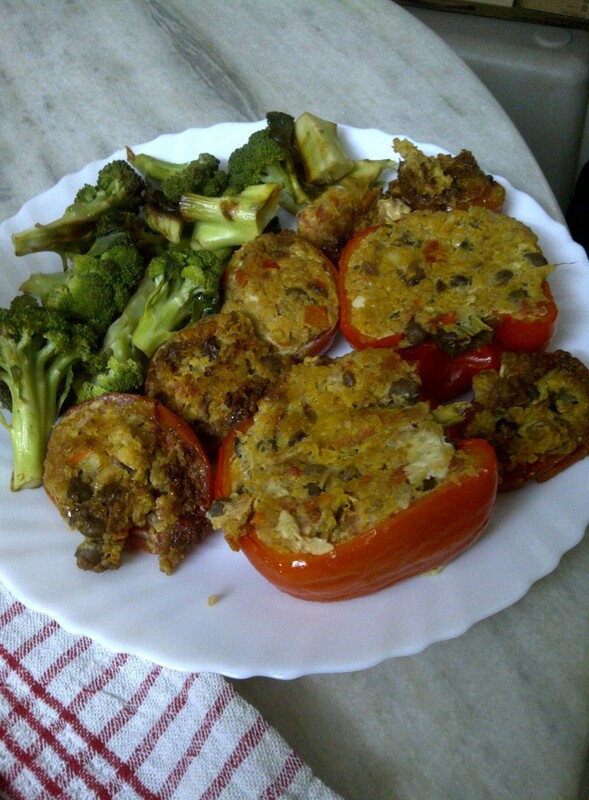 You can use it as a base it in a variety of different cuisines and it will make itself at home. It is also an extremely flexible seed. Use it in a stuffing, popped, sprouted, in a batter and it gels with its fellow inmates without shouting for attention. Unlike most foods, it is a complete protein with all the nine amino acids. We all know about the health benefits of fibre. Quinoa contains almost twice as much fibre compared to other grains. It is full of iron. It contains high level of lysine, a type of essential amino acid which human body needs for tissue growth and repair. It is rich in magnesium which is important to control blood sugar level, detoxification, regulate body temperature and promote healthy teeth and bones. It has high levels of manganese. Today’s recipe of Indianised quinoa is relatively simple. You can use any combination of vegetables such as cauliflower, broccoli, courgette, sweetcorn, pepper, green pea, french beans, carrot, pumpkin, squash and fresh beans. 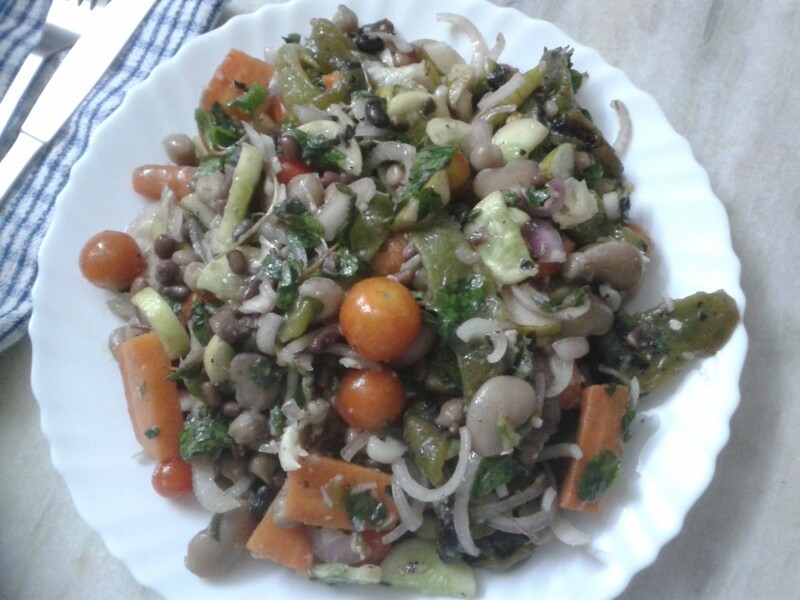 I had cooked with french beans, green peas and carrots along with onion and tomato. A note on the cooking medium. This recipe tastes best if cooked in ghee (clarified butter). Of course, you can use oil if you prefer or a combination of ghee and oil. As with everything else in life, it boils down to personal taste but in my humble opinion, ghee works best. Peel, wash and finely dice the onion. Wash and chop the tomato. Wash and finely slice the green chilli. Peel, wash and grate the ginger. Wash and chop the fresh coriander. Break the dry red chilli into two. Heat the ghee or oil in a frying pan. Once hot, lower the heat and throw in the mustard seeds. As soon as they start crackling, add the asafoetida, broken dry red chilli and curry leaves. Stir for about 15 seconds. Add the peanuts, chana dal and urad dal. Stir for about a minute or so till the dals turn a couple of shades darker. Next, add the onion, sliced green chilli, grated ginger, turmeric and salt to taste. Uncover and add the chopped tomato. Cover and cook for 3 to 4 minutes. Uncover and add the quinoa. Stir around for a couple of minutes. Mix the yoghurt into 2.5 cups of water. Add this mixture to frying pan, stir for one last time, cover and cook for about 25 minutes till the quinoa and vegetables are thoroughly cooked. At the end of cooking time, you should end up with a dry, pilaf like dish. If you find that there is still too much liquid remaining, remove the lid and cook for a few more minutes till it dries up. A few drops of lemon juice is optional and depends on individual taste. Here’s a summer friendly salad recipe which can be enjoyed on its own with a glass of white or rosé (and some bread, if you are so inclined). It is very easy to assemble and doesn’t take much time but it does require a bit of planning since you have to marinate red cabbage, beetroot and onion. This salad includes uncooked courgette, a first for me. I have recently developed a taste for this vegetable in its raw form (in salads) thanks to a friend. Wash and finely slice the red cabbage. Peel, wash and halve the onion. Slice in fine rings in half moon shape and separate the rings. Wash and steam the beetroot for about 7 to 8 minutes (depending on its size). You want it just a wee bit tender, not cooked. Once the beetroot has cooled down, slice it in thick matchstick like shape. Take a bowl with a lid. Throw in the sliced cabbage, onion rings and beetroot. Add the vinegar, juice of 1 lime or lemon and a pinch of salt. Toss well, cover and let this marinate for about 5 to 6 hours. When you are ready to assemble the salad, wash and halve the cherry tomato. Wash, de-core, deseed and halve the pepper. Finely slice each half. Wash and remove both ends of the courgette. Cut it in half and slice it along its length. Slice each halved length into half moon shape. In a salad bowl, throw in the pepper, cherry tomato and courgette. 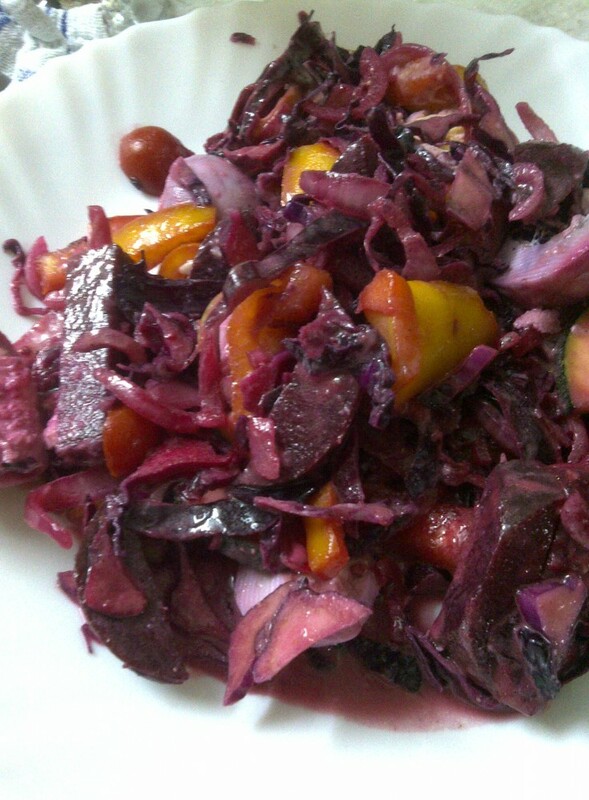 Add the marinated cabbage, beetroot and onion mixture. Add olive oil, mustard, juice of 1 lime or lemon, salt and pepper. Ragi (finger millet) by its very nature is deep red in colour so whatever you make from it turns out dark. Unlike most traditional dosas, the batter for these doesn’t need to be fermented. You can make it ahead of time if you like (this is what I did) but not absolutely necessary. My recipe includes finely grated courgette to boost the nutritional value. Having tried both with and without extra vegetable, I can honestly say that there isn’t much difference in terms of taste so it is not like courgette is coming in the way of enjoyment. Addition of courgette and onion means you are getting two of your five-a-day without much effort. A couple of points about making and timing. These dosas require a bit of time, patience and a gentle hand. Even if you pour a thick layer of batter, by the time they cook they become crêpe-like slender. Cooking time will depend on the type of pan you are using (non-stick, cast iron, seasoned, unseasoned). I made mine in a non-stick pan and noticed that cooking time reduces as you go along. The quantity given below turned out 3 dosas. 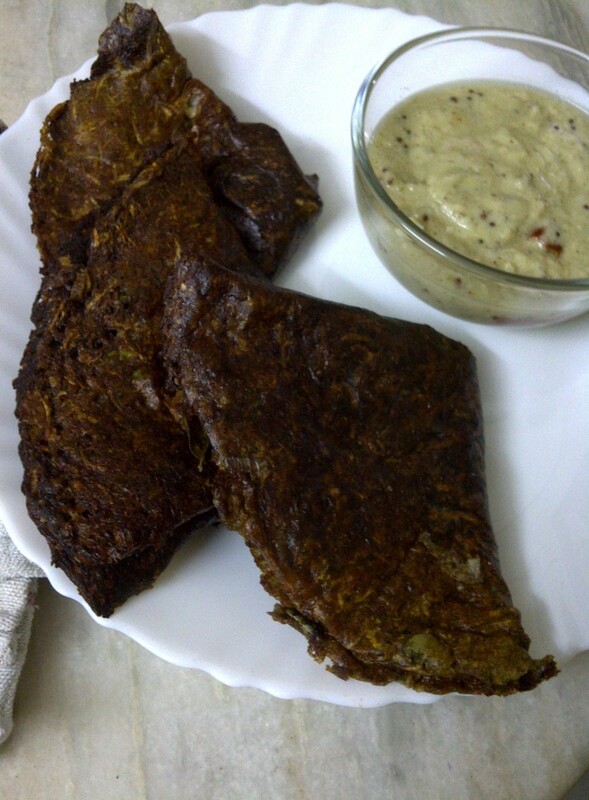 Enjoy with some South Indian style chutney. Wash and finely grate the courgette. Wash and finely slice the chilli. Peel, wash and finely grate the ginger. Take a large mixing bowl and add the ragi flour, quick cooking oats, finely chopped onion, curry leaves, grated courgette, sliced chilli, grated ginger, yoghurt and salt to taste. Mix well and add about 1/2 cup of water. Once again, mix well and check for consistency. Yoghurt, courgette and onion should release sufficient moisture of their own but if you feel the need, add a bit more water gradually. You should end up with a thickish batter, not a thin one. Take a frying pan with a lid and heat it. Once the surface of the pan is hot, lower the heat and pour a couple of ladlefuls of batter. Spread it across the surface of the pan. Now add drops of oil all the way round the edge of the dosa. Cover and cook on low heat for 20 to 25 minutes. Uncover and loosen the edges with a palette knife (or an equivalent). Don’t be in a rush to flip over. Only if the dosa comes off the edges easily should you turn it over. Cook the other side for 20 to 25 minutes. Once again flip over so that the original side is face up. Fold in half or quarter and remove to a plate. Do the same with the remaining batter. The next couple of dosas should take less time but check with a palette knife before turning over. In my non-stick, unseasoned pan, the first dosa took a long time to cook. Depending on the type of pan you are using, you may wish to check whether the under side is done after 10 to 15 minutes. The time I have given is indicative. I am so very excited to share this recipe with you. My relationship with sprouted grains and legumes is very haphazard and filled with uncertainty. I work backwards as in sprout first and than wonder how to make use instead of planning a recipe and sprouting according to requirement. This time round, I had a batch of beautifully sprouted green desi chana (small green chickpea) with long white tail. 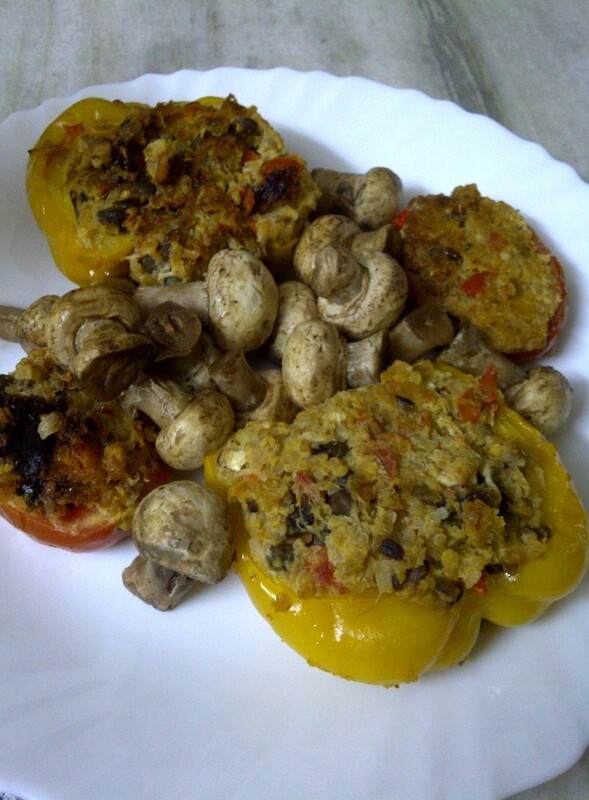 Since I haven’t had quinoa for a while, I thought of combining the two but realised that there would be too much protein and so came up with the idea of stuffing some peppers with both along with pumpkin for balance. These are one of the best stuffed peppers I have eaten. Sorry if this sounds far from humble but they are just so utterly piquant and heavenly and also totally satisfying. Since there was some stuffing leftover, I used it to fill a couple of tomatoes. Works beautifully. Which makes me think that the stuffing would work well in courgette and aubergine as well. I served some quickly stir-fried mushroom and broccoli on the side. Once the peppers are cooked, remove them to a plate. Add a couple of spoonfuls of Worcestershire sauce to glaze the pan, throw in the vegetable of your choice with a pinch of salt, give it a stir, cover and cook on low heat for about 5 to 7 minutes. You will have perfect accompaniment to the stuffed peppers. Wash and finely mince the chilli. Wash, peel and finely grate the pumpkin. Dry roast the sunflower seeds and walnuts till they turn a couple of shades darker. Set aside to cool. Once it is hot, lower the heat and throw in the onion, garlic and chilli. Add salt to taste, mix well, cover and cook for 5 minutes. Next, add the tomato and cook (again, covered) for 3 to 4 minutes. Uncover and add the sprouted beans and quinoa. Add 1.5 cups of water along with the stock cube, stir thoroughly, cover and simmer for 20 to 25 minutes till the quinoa is cooked. Uncover and add the grated pumpkin to the pan. Mix well and let the stuffing cool down. Wash the peppers, halve them and remove the seeds and core. Take a couple of drops of olive oil in the palm of your hand and rub the pepper halves all over. Beat the egg(s) and add them to the stuffing along with crumbled feta. Break the toasted walnuts with your hands and add them, along with the sunflower seeds, to the stuffing. Mix well. Fill the pepper halves with the stuffing. Heat the pan in which you had made the stuffing. It should have some residue oil remaining so you don’t need to add any more oil but if you feel the need, add a couple of drops and swirl it around the surface. Once the pan heats up, gently place the peppers, lower the heat, cover and cook for 15 minutes. Uncover, flip them over, cover once again and cook for 10 more minutes. Uncover and gently turn the peppers over so that the stuffing is facing up. Slide them onto a plate and serve. These peppers can be eaten hot but are equally enjoyable at room temperature. You can make the stuffing ahead of time and keep it till you are ready to cook the peppers. Try and use different coloured peppers. The quantity of chilli may seem a lot, specially since the bird’s eye variety is hot, but they provide the right amount of oomph to counterbalance the natural sweetness of peppers and pumpkin. You can reduce the quantity if you prefer.